This is not me falling off the wagon, I promise. I'm still committed to the 95 Days of Glory (although the past two days have made that the 93 days...). I used the ski trip this weekend as my excuse to try some new sweet recipes that are not part of my healthy eating plan. But I didn't have more than a sample, and today left the remainder in the mountains for my friends staying over until tomorrow. So selfless. 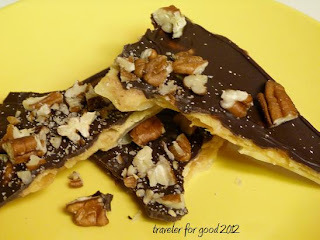 I've tried saltine toffee once or twice, but never really looked into how to make it. Inspired by a recipe that I saw in Taste of Home, I made it for ski trip snacking. Take your 15x10 inch jelly roll pan and line with foil. Preheat your oven to 350. Arrange saltines in a single layer on the foil. I ended up breaking the crackers in half to fit the last spaces. In a large saucepan over medium heat, melt butter. Stir in sugar and bring to a boil. Cook and stir for 1-2 minutes until sugar is dissolved. Pour evenly over crackers. I can tell my pan was a little bowed, because I needed to tilt the pan a little bit to get all crackers evenly covered. Bake for 8-10 minutes (next time, I'll probably go a little longer...that whole bowed pan meant that sugary, buttery goodness didn't cook as evenly as it should have). Once pan is removed from the oven sprinkle chocolate chips and allow them to melt. Use a spatula to smooth melted chocolate and then sprinkle with chopped pecans. Allow to chill in the fridge for at least an hour (longer is better for us bowed pan girls) and then break into pieces and store in an airtight container until every last morsel is consumed. I need more ski trips to justify my baking habit.